Welcome to this edition of Europe’s Digital Agenda. In this space we uncover and detail last week’s digital developments from across Europe, highlighting the most relevant news as well as EU institutions’ forthcoming activities. Last week, we had a busy agenda that included developments in EU investigation into Amazon’s use of merchants’ data and a Commission new guidance for ending unjustified geo-blocking across Europe. 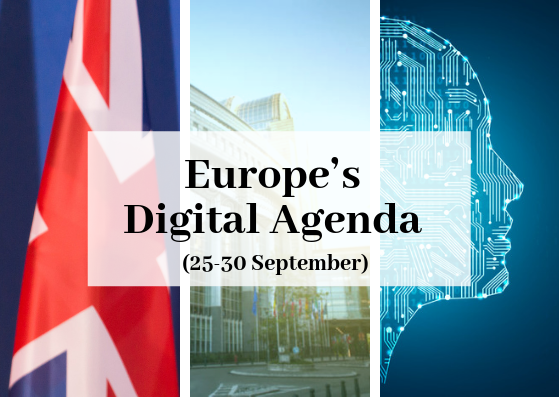 This week, we will discuss key developments around the cross-border digital identification for EU countries as well as the potential consequences of the recent Facebook’s data breach. We will also discuss Brexit and the development of the European supercomputing initiative. In this edition we will also present a look at ‘The Week Ahead’ where we will help you decode the future by outlining the next week’s most relevant digital meetings and events. Cross-border digital identification for EU countries comes into force. The EU-wide legislation on the electronic identification (eIDAS Regulation) entered into force on September 29, enabling cross-border recognition of the electronic ID and allowing European citizens to share their identity data when necessary across member states. People will be able to use their electronic ID (eID) such as ID cards, driver licences, bank cards and fill tax returns in online, access medical records and online public services across the EU. EU countries are now legally obliged to recognise national eID systems from other EU country, which have already notified and comply with the eIDAS Regulation. The eIDs aim to save European public administrations and businesses more than £9.8bn (€11bn) each year. 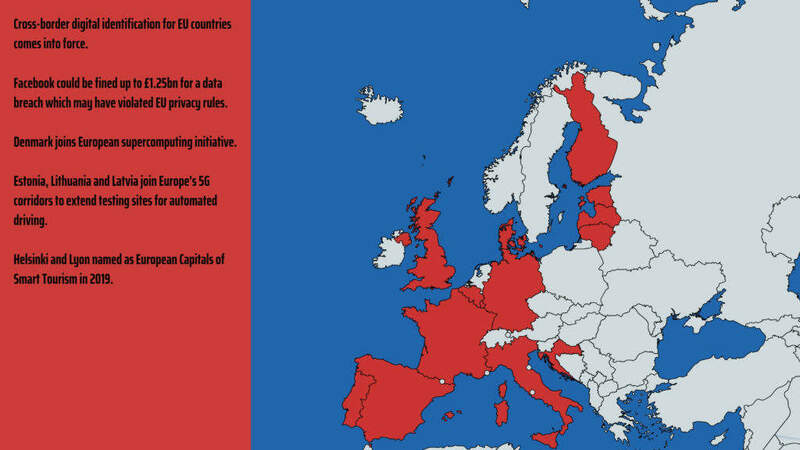 Italy and Germany have already completed their notification procedure, Spain and Luxembourg are about to complete the process, while the UK, Croatia, Estonia, Belgium and Portugal have also started the implementation procedures. Facebook could be fined up to £1.25bn for a data breach which may have violated EU privacy rules. The EU privacy watchdog may sanction Facebook as much as £1.25bn for a recent data breach announced on Friday that compromised the personal information of more than 50m of users. According to an article on the Wall Street Journal, Ireland’s Data Protection Commissioner, (Facebook’s lead regulator in Europe), demanded from Facebook more information about the nature and scope of the hack, which may have violated General Data Protection Regulation (GDPR). The regulation, which went into effect in May, aims to safeguard the data of individuals within the European Union. Under GDPR regulation, businesses that do not sufficiently protect users’ data can face fines up to £18m (€20m), or 4% of the company’s annual revenue, depending on which sum is larger. In Facebook’s case, it was estimated that the maximum fine would be £1.25bn, according to the Wall Street Journal. The legal case is likely to centre on whether Facebook took appropriate measures to safeguard its user data before the breach. Under GDPR regulations, businesses are also required to notify regulators within three days of a potential breach, facing a maximum fine of 2% of their global revenue. Ireland’s Data Protection Commissioner said Facebook had notified the breach within that timeframe. Denmark joins European supercomputing initiative. Denmark has become the 22nd European country to sign the European declaration on high-performance computing. The initiative aims to pool European and national resources to build and deploy world-class supercomputers in Europe. It will run under the EuroHPC Joint Undertaking, which is due to begin operations before the end of this year. EuroHPC will cover the whole value chain from technology components to systems and to applications. It will also offer expertise and training with a particular focus on helping small and medium-sized companies. Estonia, Lithuania and Latvia join Europe’s 5G corridors to extend testing sites for automated driving. The three Baltic republics Estonia, Lithuania and Latvia have agreed to develop an experimental 5G cross-border corridor that will allow the testing of autonomous vehicles on motorways. The so called ‘Via Baltica – North’ agreement aims to extend the pan-European network of 5G corridors that was initiated by the Commission during the Digital Day 2017 involving 29 EU and EEAS countries. The large-scale testing will take place in European cities and along major transport paths. The corridor is expected to allow connected and automated driving and mobility in a secure and safe environment. The Commission also launched the European 5G Observatory, which will update it on the latest market developments, including actions being undertaken by the private and public sectors, in the field of 5G. The Observatory focuses on 5G developments in Europe, along with major international developments (USA, China, Japan, South Korea, etc.) that could impact the European market. The Commission has been investing £620m (€700m) for the development of 5G in the context of the 5G Public-Private Partnership as part of the research programme Horizon 2020. Helsinki and Lyon named as European Capitals of Smart Tourism in 2019. Helsinki and Lyon have been announced as winners of the first edition of the European Capital of Smart Tourism competition. Throughout 2019 the two cities will be given EU wide visibility and will be provided with networking opportunities, exchange of best practice and expert support. In addition, four cities have been recognised for their outstanding achievements in digitisation (Copenhagen, Denmark), accessibility (Malaga, Spain), sustainability (Ljubljana, Slovenia) and cultural heritage & creativity (Linz, Austria). The winners, which will be officially rewarded at the European Tourism Day conference in Brussels, have been chosen among 38 cities from 19 EU member states. Labour passed a motion at its annual conference in Liverpool that left the door open for a second Brexit referendum. The move came after the PM’s ‘Chequers’ proposal was rejected at am EU Summit in Salzburg last week. Theresa May said she was ready to consider the EU’s concerns. May called on her party at the opening of the conservative’s conference to unite behind her plan to leave the EU. “My message to my party is let’s come together and get the best deal for Britain. At the heart of the Chequers plan is a free trade deal, a free trade area and frictionless trade … Chequers at the moment is the only plan on the table that delivers on the Brexit vote … and also delivers for the people of Northern Ireland”, she said. Boris Johnson and David Davis are now pushing for a ‘Canada-style’ free trade deal with the EU – a proposal the PM said will split Northern Ireland from mainland Britain by making the British province adhere to different customs rules. However, Chancellor of the Exchequer Philip Hammond said the UK has the fiscal capacity to cope with leaving the EU without any agreement but also believed the mood in Brussels was to reach a divorce deal. Meanwhile, the House of Commons would back a ‘Norway-style’ Brexit deal with a customs union, pro-EU Conservative MP Nicky Morgan, a former minister who heads parliament’s Treasury Select Committee, said. The Conservative Party continues its Autumn Conference. EU summit. MEPs to discuss their priorities for the 18 October meeting of EU heads of state or government in Brussels. EU Datathon 2018 to take place in Brussels. The EU Datathon is a competition intended to highlight the potential of linking EU and national data as well as to promote the reuse of open data. Jeane Freeman, Scottish Cabinet Secretary, to speak at the Royal College of General Practitioners conference. Final day of the UN General Assembly. EU Horizon 2020 Energy information day. UK Department for Work and Pensions chief digital and information officer Mayank Prakash is moving on to take up a new role outside the Civil Service.